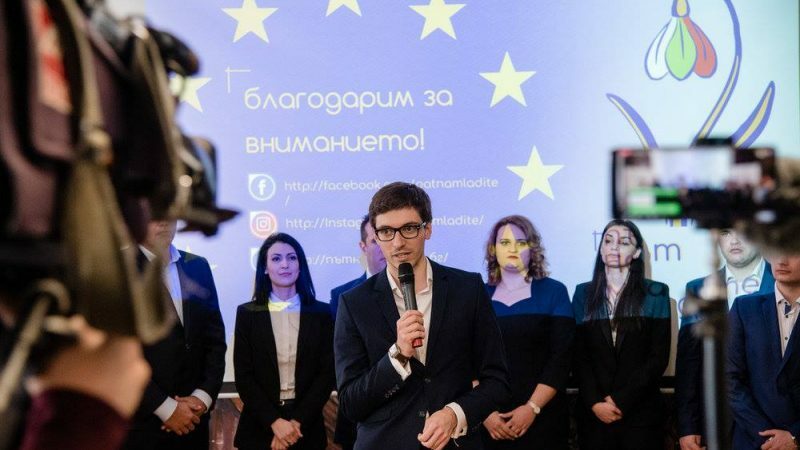 Bulgarians will be able to cast their vote for a new pro-European and pro-reform force in the European elections: ‘Way to the young’, led by London-based lawyer Rumen Cholakov, who contributed this op-ed exclusively to EURACTIV. Rumen Cholakov, 28, is a Solicitor in England and Wales with five years of experience in top corporate law firms. He is the president of Millennium Club, an NGO with the motto “Patriotism without borders”. At a conference last autumn, someone asked me this question: How do you see Bulgaria in fifty years? My answer astonished the audience. I said that I don’t see Bulgaria as a separate country but as part of the United States of Europe. Many people will call me a fool and others a national traitor. Perhaps this ambition is much further away than fifty years. But we must face the choice we have today and it is a simple one. We either go forward or we go backwards. What we have learnt from the past ten years since the Greek debt crisis, the migration crisis, and Brexit is that the European Union’s construction is mined with contradictions and inconsistencies. We have a common monetary union, yet separate fiscal policies; we can move freely, yet have separate border controls; we have a common decision-making process, yet member states can choose to ignore it. Our biggest challenges are long-term, but our politics is still short-sighted. Climate change and pollution, the automation of labour, and the geopolitical shift to the East require difficult decisions today to avoid calamities in the future. What is more, they require one generation to make a sacrifice for the sake of future generations. This is the backdrop against which I and sixteen other young Bulgarians, all under the age of 35, decided to form a ticket and run for the European Parliament elections. We called it ‘Way to the young’ (short from ‘Give way to the young’). Most of us are members of Millennium Club Bulgaria, an NGO of millennial Bulgarians living abroad, which I established three years ago with the purpose of giving my generation an opportunity to participate in Bulgaria’s socio-political life. While we are backed by and use the registration of two centrist-liberal parties (NDSV and Novoto Vreme, which governed Bulgaria from 2001-2009), we remain independent, decide on all of our policies and views and run our own campaign. Most importantly, none of us has ever held political office, a key factor to gain the trust of disillusioned Bulgarians seeking change and hope. Par excellence, we are one of the many political start-ups recently erupting across Europe. Bulgaria is desperate for change. Joining the European Union in 2007 was a milestone in our history, but progress since then has been slow. Membership of the eurozone and Schengen area remains distant and we continue to be the poorest country in the EU. The government is embroiled in scandals of corruption and is propped up by nationalists, while the opposition is becoming ever more anti-European and dominated by its Russian orientation. The pockets of pro-Western right-wing parties remain weak, distant, and anachronistic due to their fixation with communism and continued reliance on old politicians who have been active since the early 90s. This makes the country an easy prey for demagoguery. But there is another way. Many of Bulgaria’s problems have European solutions and many of Europe’s problems can be solved through further integration. To tackle corruption, we should elect a strong European Public Prosecutor and arm the office with wider powers to investigate abuse of power in member states. To fight the democratic deficit, we should replace the president of the European Commission and the president of the European Council with a directly-elected European President, with whom we can all relate as European citizens and who can safeguard our democracy. To stop uncontrolled migration, we should create a common European army to defend our borders and work closely with NATO for our security. To fight pollution, we need a European-wide transition away from burning solid fuels. We can be strong in our political and economic unity and still remain different socially and culturally. We are seeing hope all over Europe and we have many possible allies. La République en Marche! is an obvious one, but there are many others. In Spain, Ciudadanos may hold the keys to power. Slovakia recently elected its first female president who pledged to ‘Stand up to evil’. Closer to home, the new Save Romania Union is gaining strength. Other members of ALDE and the Greens and even some of the more progressive members of the EPP could be our natural friends. That is why we have decided to wait for the landscape of the new European Parliament before affiliating ourselves with any political family. The year ahead will be momentous and a turning point for our European future. For the past twelve years, I have lived in the United Kingdom and Brexit was a wake-up call for me and many others from my generation. When we are idle, others make the choices for us and leave us with the consequences. It is time for us to participate and shape our future. Massimo D’Azeglio famously said in 1861: “We have made Italy, now we need to make Italians”. I believe that my generation is the first generation of Europeans and it is up to us to defend the benefits of free movement and education, which we have reaped. It is up to us to fight for long-term goals, challenge the establishment through practical rather than ideological solutions, and come up with the post-populist alternative for the peace and prosperity of Europe. Do I sound naïve? Have I told you nothing new? I hope this is the case. Because today, more than ever, we need to remind ourselves of the well-forgotten truths and give way to the naïve optimism of those who dream of a better world and look far ahead and up towards the stars.